But then, on a balmy night at a packed Melbourne Arena, Murray did what Murray does best: he simply refused to give in. Hobbling from the off, he fought and he battled, he roared and punched the air – he could not find a way to beat Roberto Bautista Agut but, for four hours and nine minutes, he gave the struggle every ounce of strength and passion he could muster. The Spaniard won the match 6-4, 6-4, 6-7, 6-7, 6-2 but Murray had won the day. It was a match that no one wanted to miss and yet no one wanted to watch – the thought of seeing a crocked former world No 1 reduced to a shadow of his former self and bidding a sad farewell to the life he loves so deeply was too sad to contemplate. And yet with Murray, there is always the thought that somehow he might just be able to pull off a miracle. He has, after all, made a career out of beating the odds. For a set, Murray made a decent fist of things. It was not spectacular but he was holding his own – and that was more than most had expected after his emotional press conference on Friday. It was when Bautista Agut broke the Murray serve in the penultimate game of that set that the Scot started to look laboured and in pain. The limp was now more pronounced, the look on his face was one of resignation. His Spanish tormentor was doing exactly as expected by moving Murray around the court and into places hip did not want to go. But more than that, Bautista Agut was being clever – he is no typical baseline grinder; he can attack from the back of the court so he was making Murray move and move with purpose. And that clearly hurt. Up in the stands, the Murray support team had swelled in number. 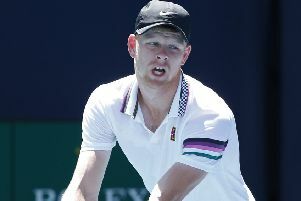 As well as the usual faces of Jamie Delgado, Matt Little and Shane Annun, there was his mother Judy, his brother Jamie and GB Davis Cup captain Leon Smith. Jamie looked as if he was sitting on tin tacks and Judy looked like she just wanted to run down on court and make it all better for her younger son. By the time Murray was two sets and a break of serve down, life looked bleak for the Scot. But that was when the old Murray, the pre-hip injury Murray made his appearance. He may have gone into the match thinking he would lose but he was not going to go down without a fight. He stepped into his returns, he went for quick winners to keep the point short and to throw Bautista Agut out of kilter. And he broke straight back. The crowd responded. This is what they wanted to see. This was the player they had come to love over the past 14 years Down Under. A run of eight points in a row got Murray back into contention and suddenly it was game on. What was becoming crystal clear was that Murray can still hit the ball as well as ever, he can still construct a point with the guile and cunning of old and he can still out-think any opponent. What he cannot do is run and turn and push off on that failing hip. But dear God, was he going to try. The way he lunged and skidded around the baseline in the third set tiebreak had the 7,500 in the stadium wincing in unison. Murray must have been in agony and yet he sensed an opening, a chance to turn the match around. If he could not take it, he was going to run himself into the ground trying. But take it he did. If the first two sets were all about him trying to play through his injury, the next two sets were all about pride, passion and instinct. He roared to his box and punched the air when the third set was won; he screamed an almighty “YES!” when the fourth was secured. And then, after more than three and a half hours of gut-busting effort, he won the opening game of the fifth set – it was the first time he had been in the lead in the match. But it could not last much longer. Murray had done everything in his power to win but now, as he leaned on his racket for support, he could do no more. Bautista Agut, pictured, had weathered the storm and now he took control. The Scot had, probably, possibly, maybe, played the last match of his career. Only as he served at 5-1 down and the crowd gave him a standing ovation did the tears return, but only briefly. The end was almost nigh.